Integrating Canon's renowned optics and imaging technology, including a 10x HD video zoom lens with Super Range Optical Image Stabilization and a Canon True HD 1920 x 1080 CMOS Image Sensor, the HV20 HD Camcorder records true 1080 high definition video, making it an ideal companion to today's HD televisions. "This HV20 HD Camcorder dramatically raises the bar for consumer camcorder capabilities, and will no doubt be the model of choice for discerning video enthusiasts who accept nothing less than premium quality equipment to capture and preserve their memories," states Yuichi Ishizuka, senior vice president and general manager of the Consumer Imaging Group at Canon U.S.A., Inc. "Clearly, the High Definition video revolution is upon us, and as HDTV's begin to dominate the marketplace, videographers and viewers will expect and demand superior image quality from their home video productions." In addition to the HV20 HD Camcorder's horizontal design, the HV20 HD Camcorder incorporates an array of new and sought-after features and enhancements that offer users greater creative control and easier connectivity. Among the new features within the Canon HV20 HD Camcorder is an Advanced Accessory Shoe capable of accommodating such additional components as select external video lights or directional microphones. 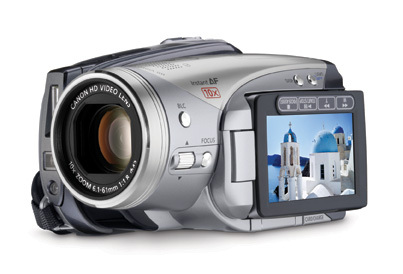 The HV20 HD Camcorder also features microphone and headphone input terminals with manual level control for professional quality audio recording and a 24p Cinema Mode - found previously only on professional video equipment - that offers the frame rate of motion pictures and imparts a film-like look to the video. The HV20 HD Camcorder also features an HDMI terminal for quick and easy one-cable transport of the High Definition video signal to a HDTV.